Superman is discovered unconscious in a burning field and is taken to a nearby Metropolis hospital where his presence is kept secret by the SCU in order to prevent any supervillains from attempting to finish off him. After three days of being comatose, the Man of Steel awakens and reports that he has no memory of what has happened to him for the past six days. 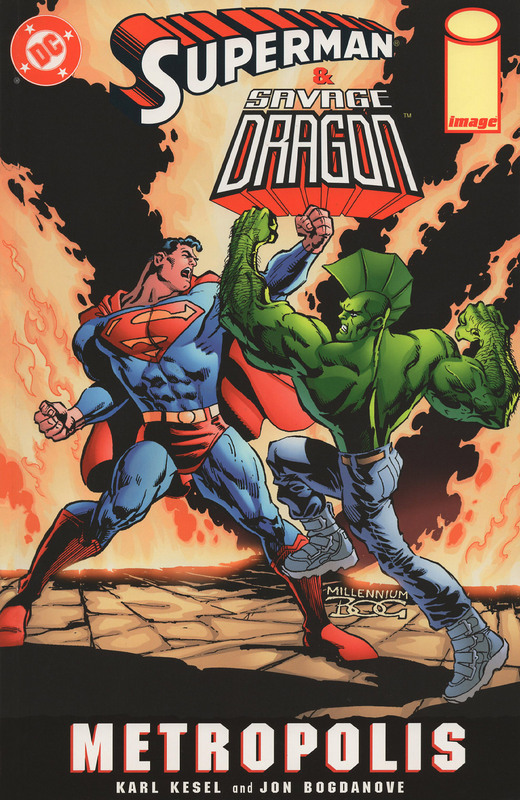 Due to the similar circumstances surrounding his discovery, Superman is paid a visit by Dragon on a trip up from Chicago to see if what his ally has been through holds any connection to his own unknown origins. Hitt and Miss appear and state that they are acting on an Intergang contract to try and kill Metropolis’ resident hero but both superheroes present make short work of them. The heroes then begin an investigation into Superman’s recent disappearance and discover that one of the Daily Planet’s reporters, Clark Kent was working on something that the alien hero seems to have followed up on. It seems that a number of homeless people have been found murdered in Suicide Slum and that it was extremely close to this location that the amnesiac superhero was found. Dragon drives himself and his temporary partner to Suicide Slum in a rented car so that he can avoid feeling sick by flying with Superman. They come into contact with the Newsboy Legion and the dim-witted Bibbo who point to the location of the murders. The pair go to the murder scenes where they find themselves under attack by a quartet called the Bad Boys. This renegade New Gods group render their targets unconscious before using a Boom Tube to take them to Apokolips. Once on the dreaded planet, the villains explain that they are planning to depose Darkseid, as their leader, the ambitious young Killroy, is the son of the former ruler and he wants the power that he believes if rightfully his. The group then reveal a new ally of their’s, gathered using a device created by Runt to open a gateway into Hell. The Fiend has been granted access to the land of the living and it was him that caused Superman to be left with amnesia after he took possession of him to ensure it was possible to control his powerful body and to leave clues to draw in Dragon to have his own revenge. As the villains prepare to make their move, the loyal forces of Darkseid arrive to repel the young upstarts and protect their master. The Fiend makes his move and takes control of Superman which allows him to give the Bad Boys the advantage in the battle. The possessed hero fights with all of his will and ultimately is able to take the mechanism keeping his slaver away from Hell and throw it to Dragon for him to destroy. Once the doomed entity is out of the way, the Bad Boys and their equally dangerous opponents are both defeated by the two heroes. It is then that the physical arrival of Darkseid himself is made and he wrongly believes that the plot to dethrone him was the Fiend’s objective alone. He orders that the members of the Bad Boys surrender and swear loyalty to him before returning the mortal superhumans back to Earth as he will not tolerate their presence on Apokolips any longer. Superman thanks his companion for all of his efforts and as a token of his friendship, he hands over his cape to him. This is a gift for Angel Murphy, who is told of the present over the telephone and is beside herself with glee. Dragon decides to pay the Man of Steel back by covering his crimefighting responsibilities for one whole night to allow him to have a night off with his wife, Lois Lane. Walter Simonson provided uncredited inks on 4 pages.